Oslo – city planning, transport, local politics etc. This is 2012, as if you didn’t know. All over the western world and elsewhere, pople, politicians and city planners are beginning to transform inner city areas as we have gradually began to understand that urban areas need to be reclaimed from the car and once again used by the community as a place where we live our lives. Markveien in Grünerløkka has for a long time been one of the most popular streets in Oslo for pedestrians. For the people of Grünerløkka, Sofienberg and even Torshov it is their main walking route into the city centre, and it has a thriving economy of independent shops, cafes and restaurants. And with very little motorised traffic, of which only deliveries to the shops are necessary, it is the perfect candidate for a pedestrian area, free of cars. The bydelsutvalget (borough council) understood this and passed that it be transformed into a pedestrian area. The city council followed this up by also passing that the lower half of Markveien be paved over and motorised traffic removed. The job of implementing the policy were then passed on to the Department of Environmental Affairs and Transportation (Bymiljøetetaen), which hired Norconsult to work out the details. The result of this process is becoming all too familiar, and is happening time and time again. What starts off as a decision by our elected local politicians to make changes to existing streets in Oslo to provide a better urban environment for residents, commuting workers and visitors, once handed over to the technicians is reduced into an exercise in making simple superficial changes that do little more than make a street look a little more pretty, and in this case less practical. In Markveien the technicians have decided that motorised traffic will remain (this in itself makes no sense, since there is no need for cars in Markveien), the two-way cycle path will be removed to allow for much-needed space for pedestrians, the road will be widened by 25cm (yes, 25cm!) to allow for cycling against the direction of the one-way traffic, and space will still be provided for the parking of cars on the street. This is incredible! Why is a considerable area of tarmac (or cobbles, wow!) to remain for the parking of a handful of cars? This makes no sense. 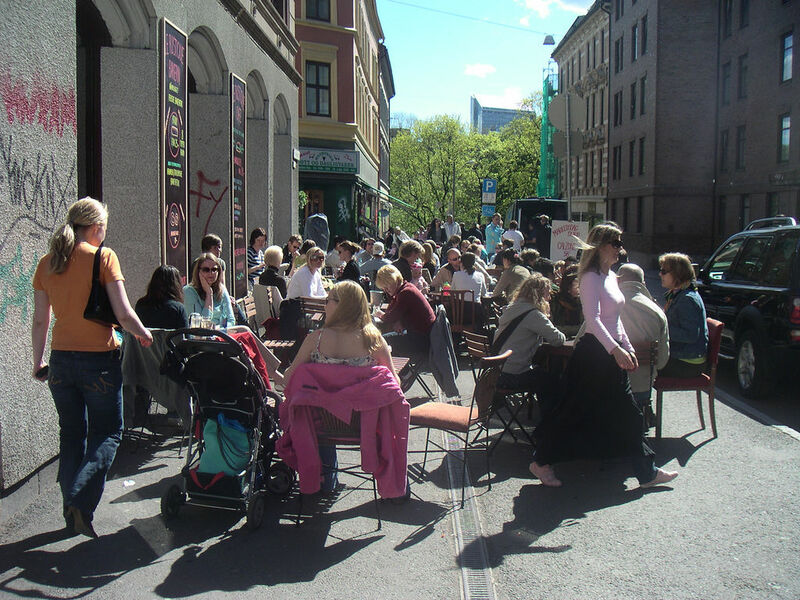 I think it is safe to say that the whole local population want Markveien to be pedestrianised, the city’s elected politicians want it, the city maintains it prioritises cycling (though, in practice, always does the opposite), visitors to Grunerløkka want it, businesses in Grunerløkka want it, yet once again it is a hired consultancy firm that makes the final decision to use hundreds of millions of Norwegian kroner on little more than laying a few cobbles and planting a few trees (and in this case erasing one of Oslo’s most used cycle paths). 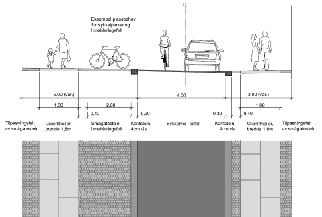 So, motorised traffic will still completely unnecessarily have 6 metres of the road width for the lower half of Markveien (that’s 3000m²) completely against the wish of the residents, visitors, local politicians and against all ideas of urban regeneration. And I think it is about time we, the people of Oslo, stood up and stopped unelected bodies make a complete mess of urban redevelopment in Oslo. They made of a mess of Carl Berners Plass, they wasted millions on Thor Olsens Gate in an exercise in planting 4 trees and laying impractical cobbles, they are about to make the same mess in Bogstadveien, where they are to reduce pavement widths by 43cm and not introduce any measures for cycling (again, decided by Norconsult). The final plan for Torgata. Note: cars still dominate, even though only delivery vehicles need to use the road. In each of these projects of urban development the original ideals of making our urban landscape an easier, safer more pleasant place to move around in have been rejected in favour of a simple exercise in allowing motorised traffic to dominate as before, and attempting to hide this fact by using some pretty and expensive paving stones and the addition of a handful of trees. I really think it is time we stood together and demanded that these regeneration projects deliver something of their original promise, and deliver to the people of Oslo an urban environment that is better, safer and more healthy than the traffic-dominated ugly city landscapes of the 20th century. This entry was posted in Oslo. Bookmark the permalink.